As I've gotten older, I've realised that my skin tolerates less and less of the cosmetic products I put on it. Can you believe that I never used to use any skincare items when I was in my teens (yes, even in my late teens), and I never had an issue! My skin was normal and clear, I rarely even got a small pimple - I was incredibly lucky. But, know that I'm in my early 20s, I have noticed that my skin is starting to lean more towards being dry than it is normal. Especially in Winter! This Winter, my skin has been having a time of it. Its been incredibly difficult to keep it smooth and hydrated, and because it is getting drier, my makeup is starting to look powdery and caked up - which is my biggest makeup pet peeve. So, I've been searching for skincare products that are going to keep my skin looking like it did before when I was a youngin' - and I believe I've found the answer/s. 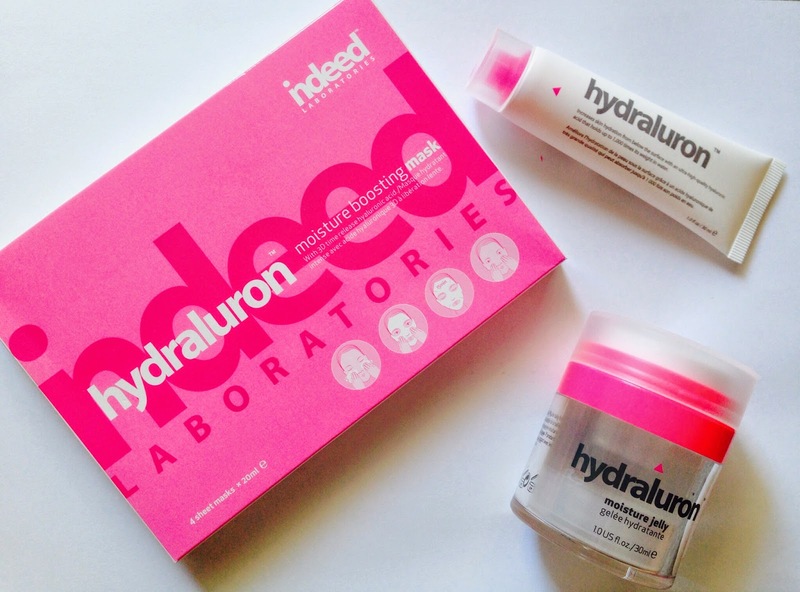 The Indeed Labs Hydraluron range is a godsend. Never before has a brand made a whole selection of products that I have been interested in. The combination of these are incredible - and my skin has never been so hydrated and rejuvenated! It makes my skin look amazing under my makeup, and best of all, my foundation is gliding on and staying un-caked throughout the day as well. I really wanted to introduce them to you guys (in case you haven't jumped on the Indeed Labs bandwagon yet), because Winter is awful for all of us, and you may be having the same issue that I'm having with my skin. Read on to see exactly what these products are, and what they do for my skin! These are sheet masks - am I the only one who never used a sheet mask before these? - and these masks contain hyaluronic acid with a slowly timed release for longer lasting hydrated skin. I basically use these every week, or every two weeks, and I press the mask into my skin and leave it for 15 minutes. After I take it off, I rub in whatever is left on my face and let it completely soak into my skin. It honestly feels like a pre-serum to my actual serum and masks my skin feel rejuvenated and refreshed! Honestly, I've used this product the least out of all of the range, but it is 100% my favourite! This also contains a pure form of hyaluronic acid as well as red marine algae to really help hydrate and nourish your skin. I love to use this in the morning as my everyday serum, and the effect it has had in such a short time is absolutely incredible. My skin absolutely drinks this up, and it has such a beautiful glowing effect. Also, you only need a pea sized amount to really moisturise your face, which is such great value for money! The newest addition to the range, the Moisture Jelly seals in the deal from the mask and the serum. It contains a combination of 5 scientifically proven ingredients that instantly provide moisture to your skin. Instead of being a cream moisturiser like most out there, this is actually a gel or a jelly as the name suggests. Like the serum, it soaks in immediately, and makes my skin feel like a babies bum. I should mention that the serum and this moisture jelly together are a match made in heaven. I use them both in the morning before going with my face for the day and there are no words. Just amazeballs. I should also mention that I do use these in conjunction with a cleansing system - its really importnat to obviously get rid of the dry patches before going in with any hydrating products otherwise they don't have the same effect! Luckily, Indeed Labs also have an Exfoliator included in their range! While I haven't tried it, given how much I love these I have no doubt that it will be a purchase in the near future. What are your must have Winter Skincare products? Let me know in the comments! *These products were kindly sent to COAMA HQ for consideration of review. All reviews are 100% honest! I recently just bought the Indeed Labs Facial Powdered Exfoliator and I love it, its so gentle and does a great job of exfoliating the skin. I might try these other recommendations that you've written here, I always thought this brand was overrated but it's impressed me! I have got those masks on my 'to buy when in Australia in 3 weeks list'. I already have a lot of products in my routine so I wouldn't quite fit the serum in, but the masks look like they'd be perfect. My skin is really dry, so I've been using a lot of Trilogy Rosehip Oil on it, and a shea butter hand cream because they get so dry too. LOve the look of that jelly! So cool!